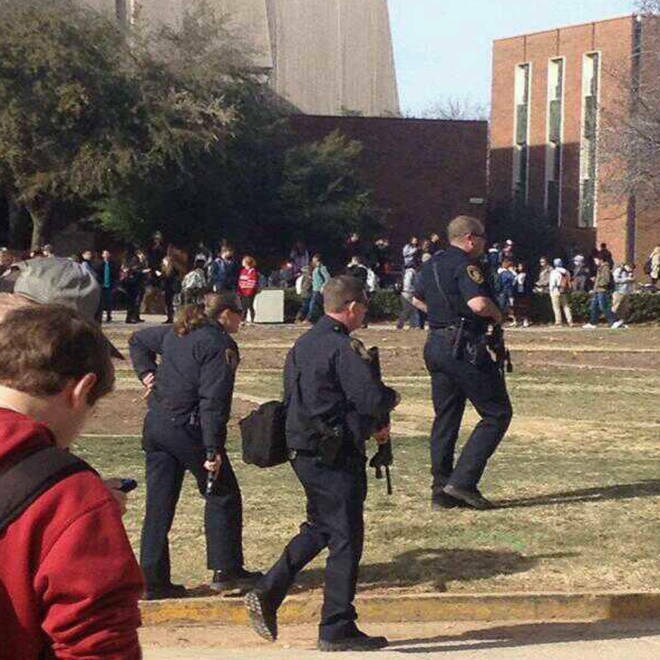 Police search the University of Oklahoma after a shooting scare. University of Oklahoma has resumed campus operations after a shooting scare. There was no evidence of shots fired and no injuries after university officials reported a possible shooting just before noon central time on Wednesday. "Shooting on campus. Avoid Gould Hall. Seek immediate shelter in place," the university tweeted. The shelter in place order was lifted shortly afterward. A university spokesperson told NBC affiliate in Oklahoma KFOR that the school had resumed normal operations, except in Gould Hall, which is home to the university's architecture school. A message posted on the school's website said, "As of this time, no evidence has been found of any shots being fired. There are no injuries reported at this time. Both the Norman and OU police department have very quickly responded as well as emergency personnel." University of Oklahoma President David Boren told students that the noise that prompted the incident may have been a machinery backfire, the campus newspaper, The Oklahoma Daily, reported. "The report came from a faculty member who indicated they thought they heard sounds that sounded like three shots fired," Boren said at a press conference Wednesday afternoon. "It seems more likely that they were other sounds." Boren said the faculty member did "exactly the right thing" by calling the police after hearing the noise. "It could have been a piece of equipment," he added. University of Oklahoma is in Norman, Okla., about 20 miles outside of Oklahoma City. More than 30,000 students are enrolled there. The scare came after two campus shootings in the past two days. An unknown gunman wounded a student sitting in the parking lot at Widener University in Chester, Pa., on Monday. Tuesday, a teaching assistant was killed by a fellow electrical engineering undergrad at Purdue University in West Lafayette, Ind.